Marcel is a monster. It is his job to scare all the neighbourhood children. And although he tries very hard, he is just not very good at his job. To unwind after work he cooks and this is his real passion. Who knew this love of cooking could help with his night job. Kids will love this light-hearted and fun rhyming story about Marcel. They will giggle at his attempts at giving kids a fright and delight in the grossness of what this monster cooks up in his kitchen. with smelly-sock soup and a cockroach surprise. The illustrations are bright, bold and suitably icky, starting from the front cover where a huge green monster – Marcel – eats worms with lashings of slime from his lunchbox while a snail escapes, making his way over Marcel’s big toe. This story has a fabulous twist in the ending and is perfect for preschool kids who delight in the gruesome and (not so) scary. 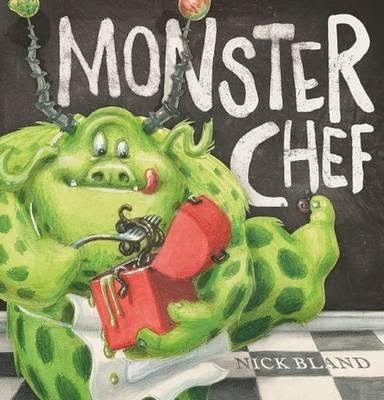 Nick Bland is the author of well known and popular Very Cranky Bear stories as well as King Pig, which was shortlisted this year for the CBCA Picture Book of the Year.